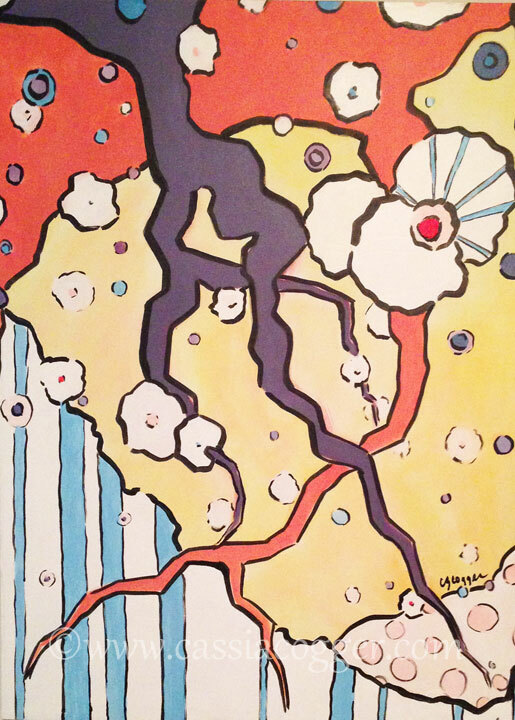 Flashback Friday- Cherry Blossoms and Finding Your Voice — cassia cogger, artist. teacher. I think the little sketch was and is one of my favorites because it was a rare moment where I got out of my own way. I stopped over thinking. I just let things happen in a way that brought me delight. Who cared if I screwed up a little scrap of watercolor paper right. I wen home and sketched this painting and worked on it almost immediately. It was completed in no more than the afternoon. I was working so intently. I was speaking through paint so clearly. In this little moment I had found my voice. At the time I was still attending the art students league and I knew the show for Frank's class was coming up. Deciding to have some fun with the piece and the process I placed a big red dot in the upper corner. Power of suggestion as well as necessary visual interrupt. The red dot did work visually. It did not work through power of suggestion. In the end I got the blue dot which was nice validation. It still hangs on the back of this piece which is still wired using a piece of string and two screw eyes because I didn't have my framing materials the morning I needed to take it over. Now when I look at this piece it really does bring me immediately back to myself. I remember my commitment. I tune in to my need for pattern and rhythm. I honor my love of bright color on canvas. I remember my voice and sometimes I even start to listen to it.